In a previous article, we have explored different ways to spoof your current location on an iOS device. It’s a handy little trick to facilitate fake Facebook check-ins and unlock geo-restricted Snapchat filters. But what if you want to spoof your current location on a Mac or Windows PC? Certain websites ask you to share your current location, so that they can serve you more relevant content. For example, a map based web application can track your current location via the web browser, and provide you with the list of diners near you. These location-aware websites leverage the Geolocation API, which provides a way to track the users’ location quite accurately, by processing data from GPS, nearby Wi-Fi networks, cell towers, Bluetooth, etc. With your permission, the web browser fetches & processes these details with the help of the API, and forwards the processed information to the specific website, allowing it to estimate your current location. On the other hand, for certain other websites, particularly those that provide geo-restricted content, it is sufficient for them to know your approximate location, typically by tracking your IP address. The site will allow you to access its geo-restricted content only when your IP falls within a particular region. Depending on your requirement, you might be looking for a way to change your current location, when a website requests for it, or to unlock geo-restricted content blocked in your particular region. In this article, we’ll explore both of these scenarios. A location-aware website will seek permission to access your location information via the web browser. If you are skeptical about sharing your location with a particular website, you can always deny access when the browser asks for it. 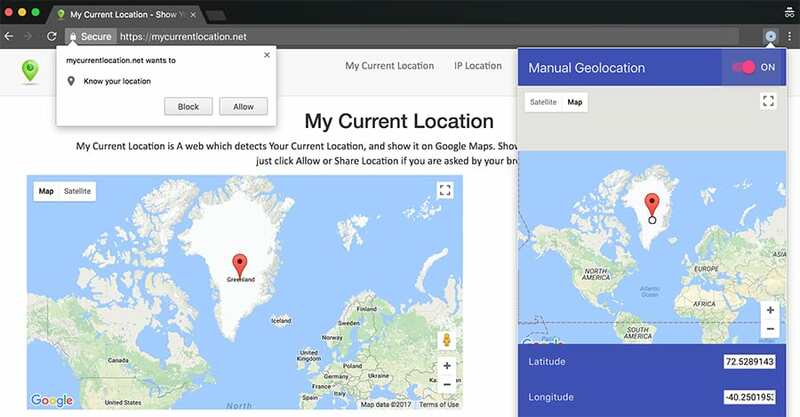 Alternatively, you can also share a fake location using the Google Chrome browser on Mac or PC. Bring up the Chrome Developer Tools by pressing the Cmd+Option+I keys on Mac, or Ctrl+Shift+I on Windows. Click on the Kebab Menu (three vertical dots) on the top right corner of the Developer Tools window (Not the Browser menu). Select More Tools >> Sensors to open a new Sensors tab in the Console window. Pick a suitable location on the dropdown next to the geolocation label. As soon as you pick a location, the corresponding latitude and longitude values of the selected locations gets filled automatically. Alternatively, you can also set custom geolocation by providing your own coordinates. Your geolocation is now overridden and set to the specified location. If any website asks for location access, clicking on Allow will now fetch the new location instead of the original one. If you find the above process complicated, you may even use a Chrome extension called Manual Geolocation to achieve the same. Manual Geolocation allows you to spoof your current geolocation by allowing you to change the Latitude, Longitude and Accuracy parameters. While the Manual Geolocation switch is turned on, the custom location set within the extension, becomes your current geolocation. If a website uses IP address to track your location instead, you can use a suitable web proxy, Smart DNS or VPN service to spoof your actual location on the Internet. A web proxy is best for text and non-media based content, while a Smart DNS is ideal for unlocking multimedia streaming sites, as they route only a small portion of the entire network traffic through the unlocked zone. Most of the connections are direct, hence providing a faster and more reliable streaming experience. Smart DNS works for specific geo-restricted websites and services, is easy to configure on multiple devices, and can be used to simultaneously access different geo-restricted services available across different regions. On the other hand, if you are looking for end-to-end encryption, better privacy and unblocked access to a particular region across all apps, a VPN service offers the ideal solution. Generally, a paid proxy, Smart DNS or VPN offers better and more reliable service compared to a free solution. But that being said, certain web apps identify and blacklist the IP addresses of popular proxy and VPN services. In such a case, you might not be able to access the particular website using the blocked proxy or VPN service. If you do know of any other ways to fake your location on your computer, let us know about it in the comments below.